There’s nothing wrong with a wild border. I love ’em. 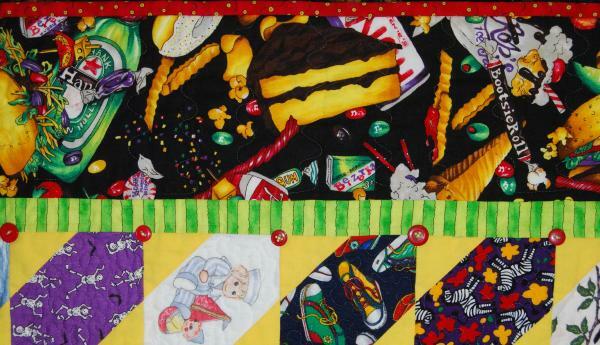 This junk food fabric was the perfect ending to Buttons and Bows, a quilt featured in, “Picture Play Quilts.” I just wish I still had more fabric. Apparently adults like funky fabric too. Several years ago, this quilt was selected by the US Ambassador to Dakar, Senegal and his wife to hang in their home. The Art in Embassies program facilitated the loan. Buttons and Bows is one of 15 patterns in Picture Play Quilts. They’re all based on squares and rectangles and come with step-by-step instructions. Best of all, there are a dozen games to play with the quilts you make that teach language skills, encourage creativity, and build self-esteem. Picture Play Quilts normally sells for $22.95. Now you can get TWO copies for $20. Go! Quickly! This offer ends May 14th. I’ve used this book so many times for reference ideas and color choices – love it! Use it to make quilts for grandkids, grandmoms (to have when the grands come over) & charity quilts for kids. Ami, you’re in luck. JoAnn’s has just started carrying food fabric again. Not so much junk food, unless you consider cup cakes junk food, but asparagus, strawberries, mushrooms, carrots, apples, and lots more. Great fun. Some is in Novelty and some is in Premium Quilter sections. Happy fabric hunting. Funky Food went into a quilt I made for my middle son. He has used it, and last time I seen, it was still being well used in his family home by everyone. They are now in Germany and it has became the family quilt on the couch, always available to whom ever needs to cuddle. I still have a bit of the fabric to use in eye spy quilts. The original fabric was purchased in the mid 90’s, don’t remember which year for certain. We were in the home I started the quilt in from 1993 to 1997, so my closest guess is 1995-96.
we came out of The Canyon by mule in december. bought the video (wilford grimley) and are still sniffling… what a humbling experience. the opportunity of a life time. we go quite regularly — but not so far from the surface. we’re now planning to go back. By Foot. what an awesome place.